We are just a week away from CES 2017, which will see a host of new technological offerings from some of the biggest names in the industry. LG is one such name that announced on Wednesday two new wireless wearable audio products to be unveiled at CES 2017. The Tone Studio wearable speakers and Tone Free earphones join the list of LG’s Bluetooth headset lineup. The LG Tone Studio features four speakers – two full range speakers on the top and two vibrating speakers on the bottom. The Tone Studio wearable speakers combined deliver a surround sound experience when watching a movie, streaming music or playing video games. LG has designed the surround sound in collaboration with DTS. The headset features a Hi-Fi DAC (Digital to Analog Converter) to enhance sound quality by recreating audio content as accurately as possible. Additionally, the headset also comes with Dual Play functionality that lets you connect two Tone Studio wearable speakers and share sound from a movie, playlist or more. 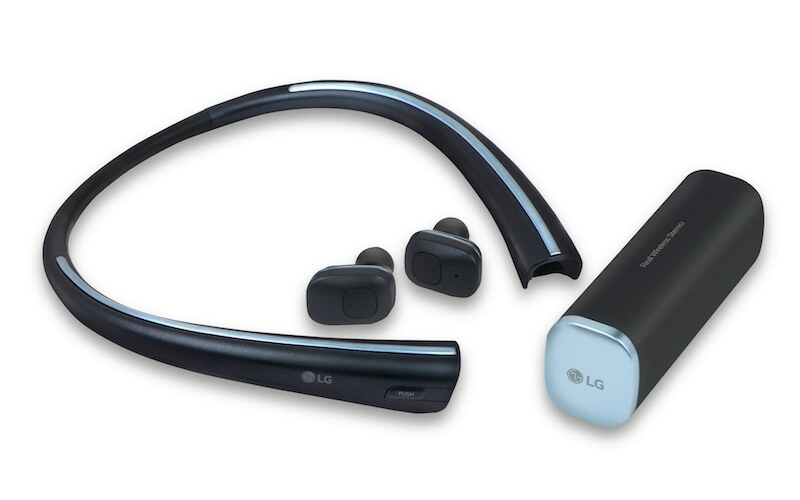 The LG Tone Free earphones are LG’s first wireless earbuds that can be charged when stored inside the neckband. The neckband not only adds more battery time to the earphones on the go, but it also provides a safe place to keep the earphones when not in use. Furthermore, the Tone Free earphones also lets you answer and ignore a call hands free through voice command. Apart from the Tone Studio speakers and Tone Free earphones, LG will also showcase the Tone Infinim and Tone Ultra headsets at CES 2017. The Tone Infinim features LG’s Metal Layer Speaker Technology for clean, crisp sounds while the Tone Ultra, in collaboration with JBL, features dual MEMS microphones for remarkable call clarity. LG’s entire lineup of wearable audio products will be on display during CES 2017 from January 5 to 8.